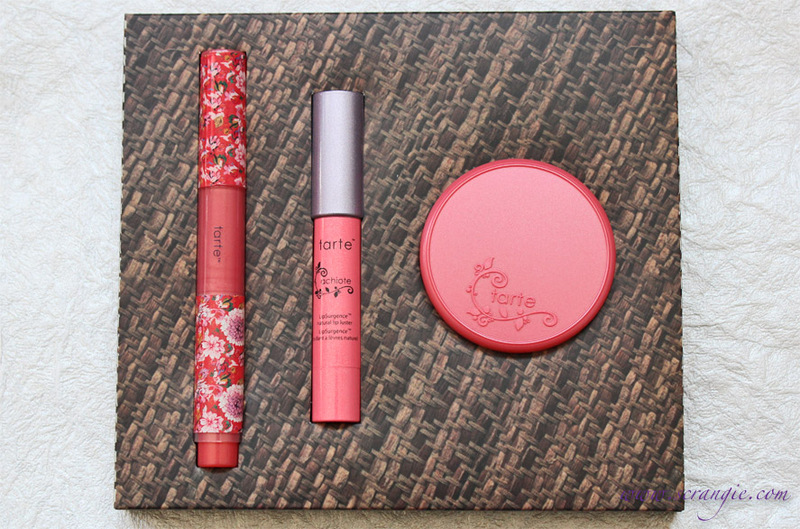 Picked up this cute little trio from Tarte during their recent sale and I have to say, I'm really digging everything in it so far. 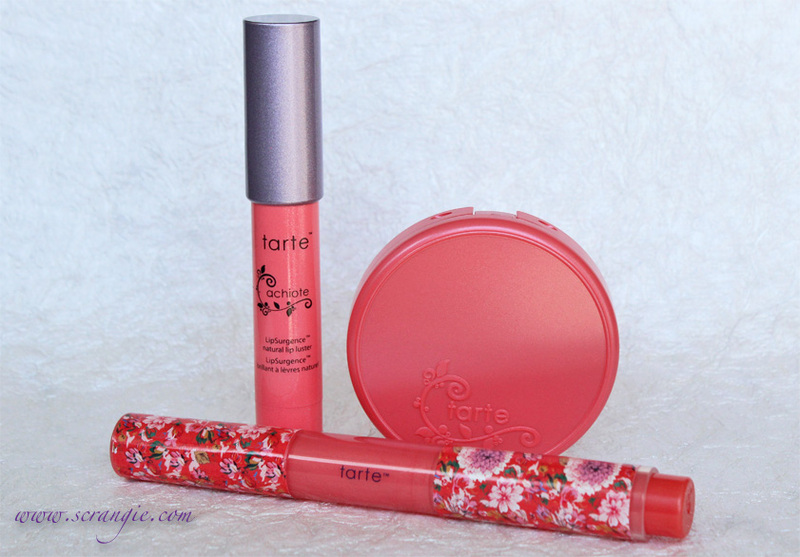 It's called Gifts From The Lipstick Tree and it contains three full-sized Tarte products. All three products in this set are in the same warm pink shade called Achiote, named for the Achiote tree which produces the seeds that are turned into the pigment and food coloring known as annatto. You may recognize the ingredient annatto, as it's most commonly used here to give processed cheese its bright orange color. The kit includes a full size LipSurgence Lip Lustre in Achiote, a full-size Amazonian Clay 12-Hour Blush in Achiote and a full-size Maracuja Divine Shine Lip Gloss, also in Achiote. Very attractive packaging. A few details to note: the pretty vine that frames the Tarte logo on the blush compact, the floral print on the gloss pen, the shimmery finish on the LipSurgence tube and the fact that each item's packaging is color-matched with the product inside. 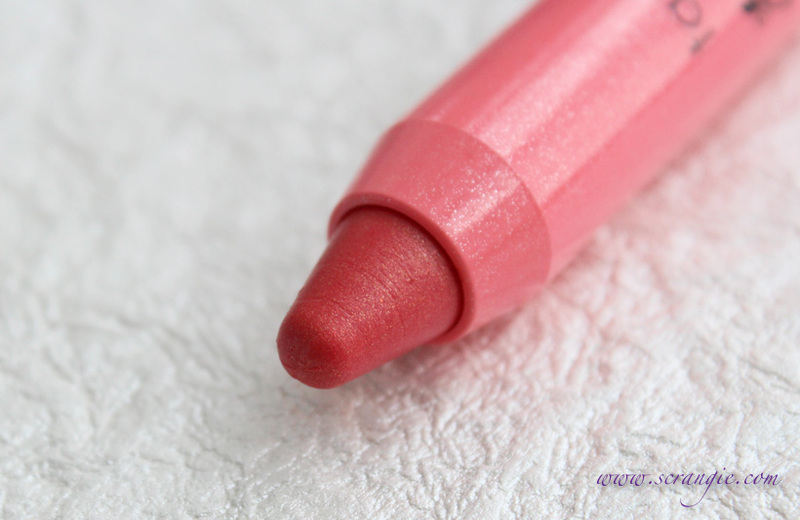 The blush is pigmented, easy to blend and long-lasting. The color is a wearable coral pink, not too orange at all. The gloss formula is thick, not too sticky, and has more color to it than the last Maracuja Divine Shine gloss I tried. It's still sheer, though. Light mint flavor in the gloss is pleasant and it also gives a slight cooling effect. 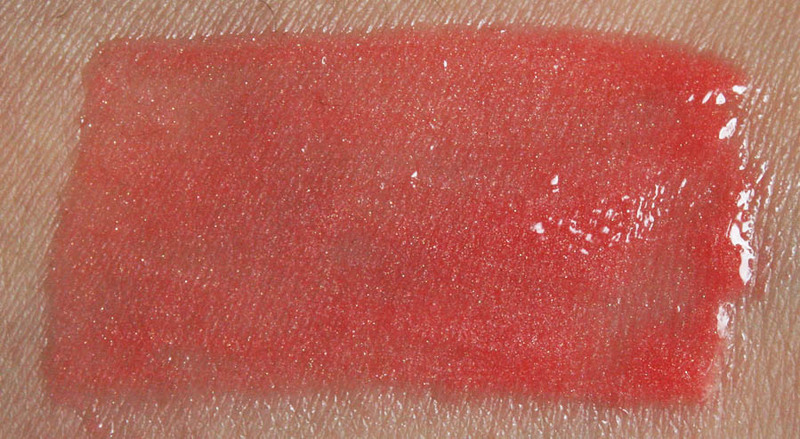 The Achiote LipSurgence Lip Lustre is awesome. It's my favorite one so far. The shade is flattering on my skintone, has a subtle shimmer, and it lasts a decent amount of time before it needs to be reapplied. It's my favorite thing in the kit. LipSurgence pencils don't require a sharpener; they twist up. The kit is a good deal. Each item in it costs around $20 individually, but the kit costs $42. It's like buying two items and getting one free. 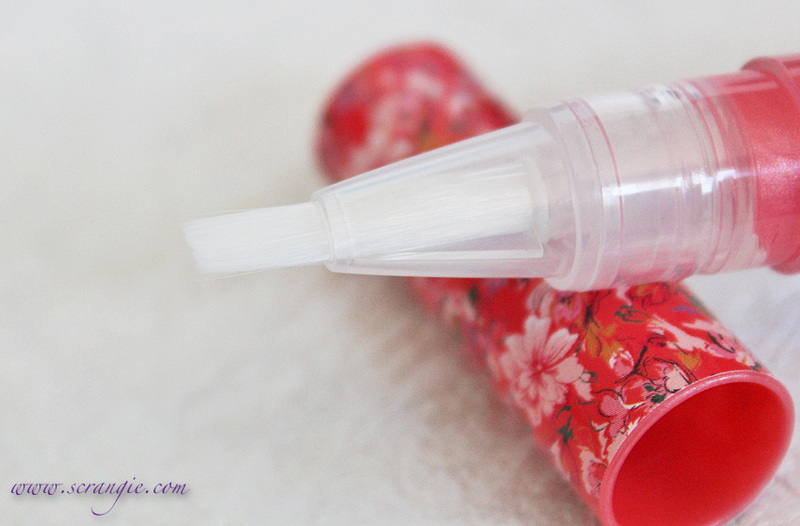 I hate the click pen design of the gloss. You have to click too many times to dispense the product, and it's hard to gauge how much product is going to come out. I would prefer a normal gloss tube with a wand, or even a squeeze tube. The gloss is sheer, it only adds a light coral tint and little visible shimmer. 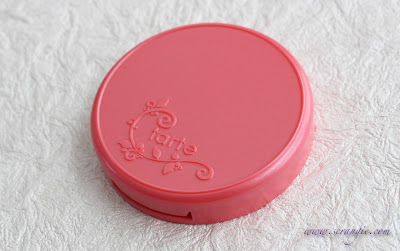 The blush pan spins in the compact. I don't know if it's going to fall out, but it does move freely whenever you touch it so it doesn't feel secure. It seems like it's magnetic. 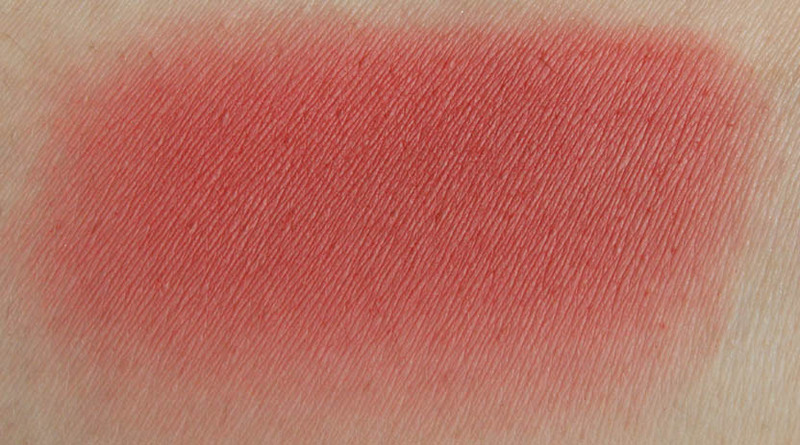 The blush changes color when applied to my skin, just like those 'self adjusting' pH reactive blushes that we've been seeing lately. I don't recall reading anywhere on the website or product description that this is a self adjusting/pH reactive product. The LipSurgence caps are prone to cracking and falling off. 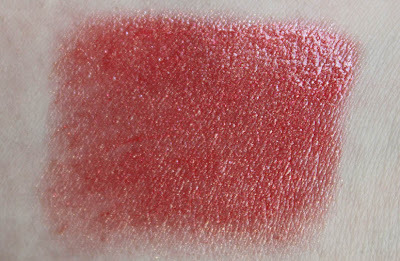 It hasn't happened with Achiote yet, but it has happened to a few of my other LipSurgence colors. I've been wanting to try their new Amazonian Clay 12 Hour Blushes, and I already knew I liked the formula of the LipSurgence Lip Lustres and Maracuja Divine Shine glosses, so even if I ended up not liking the blush, the set would still be worth it. Luckily, I liked everything in here. 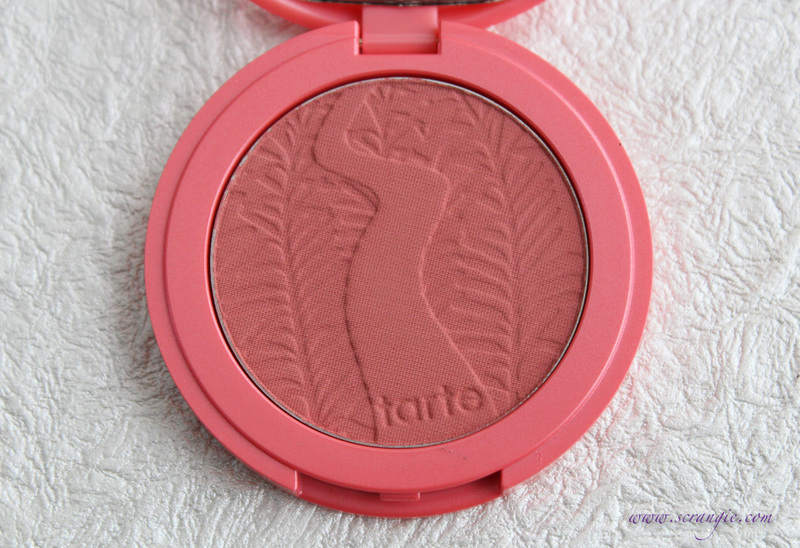 The Achiote shade is great on my skin tone, I was worried it would be too warm for me to pull off. I'm glad I tried this set, it was definitely worth it. Hope they do more like these! 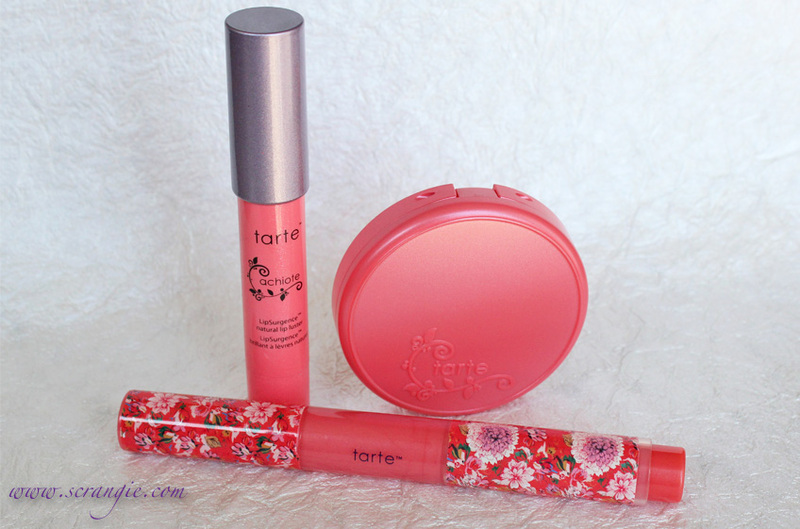 I ordered mine directly from Tarte's website, but Sephora and QVC also carry this kit. $42 for the set of three full-sized items. I would assume, with the amount of natural ingredients that Tarte uses, that maybe it's just more prone to oxidization? i think this is what's happening. checking the ingredients, there -are- iron oxides in the blush, and contact with skin oil will usually cause a pink-to-orange shift reaction. there are lake dyes in the blush to combat this to a degree, but it's not a total fix. I only have one of the Amazonian Clay blushes, but I really like it, so I've been wanting to try more. This color looks gorgeous. I just have to say... thank you for likening cosmetics to Velveeta cheese, lol. I was woken up way too early by someone outside yelling and was in a surly mood, but that just made me feel so much better. Strange enough, I'm kind of digging the swatch of the gloss. I hate gloss usually. O_O I love the look of Tarte Cosmetics - it's a pity they're not easily available in the UK- their blushes look so pretty :)- Thanks for the swatches !! On the back of the blush there is a small hole you can take the blush out and it can go on a palette, so yes it is magnetic but it is supposed to be like that. Thanks for giving such as detailed review-- I've been considering this trio, and now I know it wouldn't work for me, however I might crave it! It sounds like you got a faulty blush. I have several of their blushes and they are all secure. 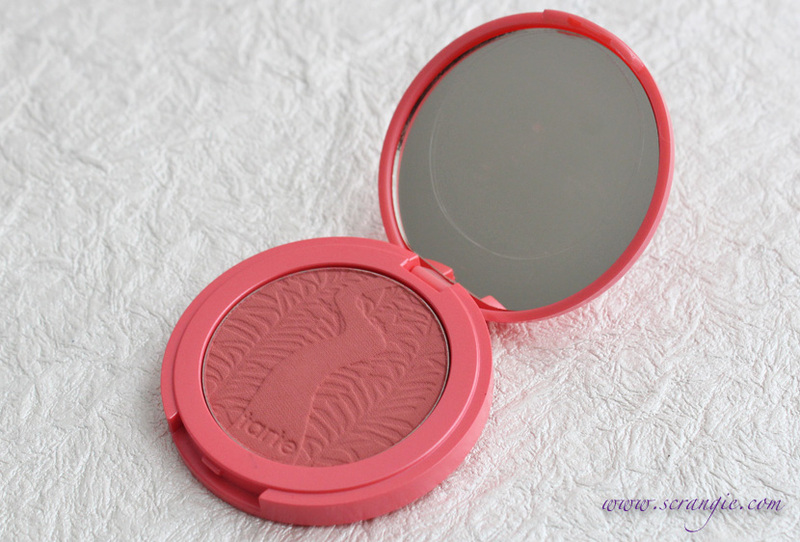 That being said, they are probably my favorite blush on the market! Actually, I adore the packaging of tarte blushes because there is a little hole you can stick a pin through on the back to pop out the (yes, magnetic) pan so you can put it in a palette! The four I have are in a large Zpalette. I recommend keeping them in the Z palette actually. I'm always dropping things and when I dropped my z palette, the blush was fine. My other blush that I kept in its compact broke apart after dropping it. Nice review and these look nice. Loving the color. Also, I really appreciate your Likes/Dislikes as it really sums up what's good and not so good about each product. Mucho gracias! The blush pan IS magnetic. It has a little hole in the back you can poke a needle through and it pops out so you can put it in a z palette or something. It's actually great so you don't have to depot it and ruin the gorgeous packaging if you want to put all your blushes in one palette! The blush pan IS magnetic! It has a little hole in the back where you can poke a needle through and the blush pops out so you can put it in a Z palette or something. It's actually a great feature because you won't have to depot it and ruin the gorgeous packaging if you want all your blushes together in one palette! That's a fabulous deal... I love their Divine Shine glosses, and their blushes! The LipSurgence stain is also quite good too. I bought this a while back and I love the LipSurgence lip luster, but the packaging on the lip gloss drives me nuts so I never think to put it on. I'm not very good with blush and when I did try putting the blush on I felt like it gave me clown cheeks, but I have acquired new brushes since then so I may try it again. What a great set, especially for the price! I love the packaging and they look like great colors for the summer. I bought this kit after seeing it here and I am in LOVE!! Thank you for the excellent review of it. So happy that I pulled the trigger. I SO wish they would release the Achiote Lipsurgence individually because I am going to need back-ups!